Love, Fiercely is a fantastic new book by Jean Zimmerman. Its subtitle, A Gilded Age Romance, is exactly the kind of thing that stops me from browsing any further at the bookshop. 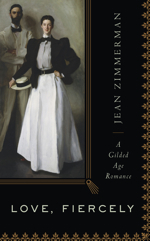 Zimmerman chronicles the true story of a beautiful heiress and a wealthy young architect in turn-of-the-century New York. Yes, theirs was a life filled with mansions, balls, and summer cottages, but these two were a bit different, too: Edith (whose face was used as the basis for a colossal Daniel Chester French sculpture) lobbied for women’s suffrage and kindergarten programs in the U.S., while Newton strove for social reform and worked on tenement renovation. On their two-year honeymoon in Paris, they were painted by John Singer Sargent. The painting, Mr. and Mrs. I.N. Phelps Stokes, 1897, is pictured on the book’s cover. Now at The Metropolitan Museum of Art, it is considered one of the artist’s bests and--with a flushed Edith in ‘everyday’ clothes--a ringing in of the modern world. Love, Fiercely is an engaging and erudite biography of this incredible couple and their passions. I heartily recommend it. Love, Fiercely is a fantastic new book by Jean Zimmerman. Its subtitle, A Gilded Age Romance, is exactly the kind of thing that stops me from browsing any further at the bookshop. Zimmerman chronicles the true story of a beautiful heiress and a wealthy young architect in turn-of-the-century New York. Yes, theirs was a life filled with mansions, balls, and summer cottages, but these two were a bit different, too: Edith (whose face was used as the basis for a colossal Daniel Chester French sculpture) lobbied for women's suffrage and kindergarten programs in the U.S., while Newton strove for social reform and worked on tenement renovation. On their two-year honeymoon in Paris, they were painted by John Singer Sargent. The painting, Mr. and Mrs. I.N. Phelps Stokes, 1897, is pictured on the book's cover. Now at The Metropolitan Museum of Art, it is considered one of the artist's bests and--with a flushed Edith in 'everyday' clothes--a ringing in of the modern world. For collectors, there is an incredible sub-narrative to savor in this book -- around the mid-point of his life, I.N. Phelps Stokes became a manic collector of prints and maps of New York City. Trying to preserve the bucolic past of his youth, he bought everything he could get his hands on and spent his entire fortune doing so. Zimmerman writes of Stokes' goal: "Collect every map, every view, every fact, every detail about Old New York. Research the city's beginnings. Bind it all together in a book of exquisite quality." Which is what he did. Titled The Iconography of Manhattan Island, the massive, six-volume set was his life's passion. In it are reproductions of everything Stokes could get his hands on, plus histories, chronologies; it took a team of researchers and more than a dozen years to complete. The edition was 402 copies, and those, Zimmerman tells us, are scarce (and expensive) today. (Christie's sold an inscribed one last year for $5,625, a steal! They tend to go for double that retail, and even the reprint editions aren't cheap.) She adds, "None of the classic or contemporary histories of New York could have been written without the Iconography as a source."